OK, now I'm gonna look at each person's submissions for the code puzzle ("Something for the weekend? A wee code puzzle (in CFML, PHP, anything really...)"). Chris has done a CFML version. He was very quick off the mark, and had his submission in before I varied the rules, so this one just solves the initial challenge which is to find the longest subseries within a given threshold, but does not consider equal-length longest subseries. Fair enough. It's fair enough the latter two tests break, as he did not code for those ones, but there is a slight glitch there with the "should return elements if there are any within the threshold" test. I guess my test is mislabelled: it should be "should return a match from a one-element array". These test that the subseries is correctly extracted if it's at the beginning or end of the series. 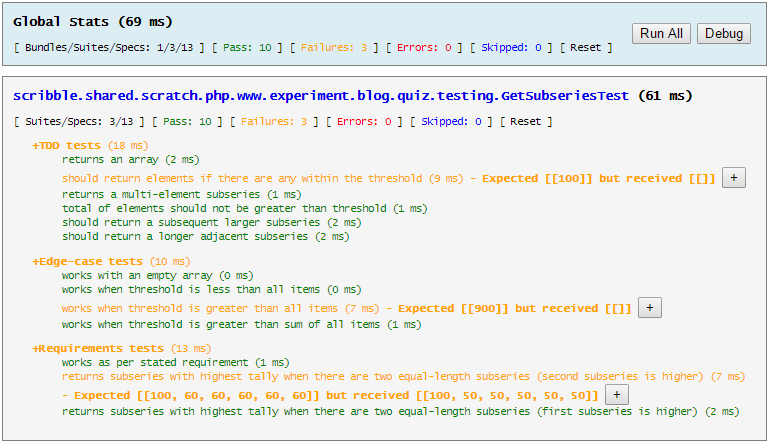 Chris had these tests in place for his own code, but neglected to have the single-element test. And [phew] my version passes all these tests still. But, realistically, there's not much in it. The thing to remember here is that if you find yourself writing a big narrative comment: your code probably needs clarification or refactoring. Try not to have comments in your code: "Comments in code: avoid if possible". OK, that's enough. Next up is Dave White's Python effort. I'm perhaps not going to be so analytical about Dave's effort as I do not know python from a bar of soap. But perhaps this will be my "in" to examine it a bit. It'll take me a coupla days to survey Dave's code, so hopefully I'll get back to you on Saturday with some feedback. Oh... there's rugby on Saturday (Ireland v Aussie). Maybe Sunday then.